Biography & Genealogy: Jaqueline Beverly Stanard, Class of 1867. New Market Cadet: "Died on the Field of Honor". Genealogy: Born- April 27, 1845. Father- Robert Beverly Stanard; Mother- Ellen Bankhead Taliaferro. Pat. Grandfather- Beverly Chew Stanard; Pat. Grandmother- Mary Bolling Fleming. Mat. Grandfather- Hay T. Taliaferro; Mat. Grandmother- Mildred "Millie" Taylor. Stanard used his middle name, and was known as Bev or Beverly. VMI Record: Entered VMI- Jan. 20, 1863; He resigned Jan. 29, 1864, but his cadetship was restored by the Board of Visitors eight days later. Private in Co. B of the VMI Corps of Cadets during the Battle of New Market. 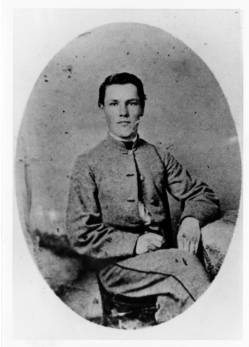 Killed in action in the battle (May 15, 1864). Buried Graham Cemetery, Orange, Virginia.